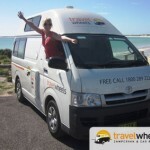 2wd campervan hire is much more popular in Australia than 4wd campervan hire. In Darwin, Alice Springs and the Northern Territory in general this imbalance is somewhat redressed, however at the end of the day there are simply more 2wd style camper vans on offer around the country. Most the campervan hire companies that supply 2wd rental in Darwin are part of a bigger company that have depots nationally. There are few (or none?) that survive just by renting campervans out from a Darwin office and nowhere else. 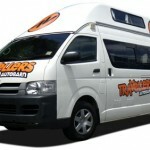 So, just how many companies are there in Darwin that will rent out campervans of the 2wd variety? Well on last count 17. Not bad for a city of a mere 130,000 people. But the attraction to this city for those companies is not the locals. I reckon you’ll find most of those locals have their transport needs sorted out already. It’s that Darwin is the gateway to so many wonderful tourist attractions from Kakadu and Litchfield national parks, the coastal areas, south to Alice Springs and Uluru, west to the Gibb River road or the Bungle Bungles or east in to Queensland and on to Cairns and Whitsunday’s. For many people it is also the outbound journey from Australia to Asia. Many a traveler will exit Australia from Darwin to head to places like Bali, Singapore and Thailand. In fact Darwin is Australia’s closest capital city to any foreign neighbor, for this reason it is common to have one way trips planned to Darwin. It is quite a popular town to have one way campervan hire drop off in. Being the biggest campervan hire conglomerate of companies in Australia (owned by New Zealand’s THL) you would expect these major companies to have a presence in Darwin. Britz is the leader in 4wd camper van vehicles but also has the most amount of 2wd campervans available and the ranks are filled with the luxury campers by Maui and the cheaper, older model campervans by Mighty Campers. Between them, these three companies can cater for pretty much any budget and and family size. Conveniently enough, rent from any of these campervan rental companies and you will be picking you camper up from the same place – about 10km from the airport. They all share the same depot so don’t be surprised to see 3 different brands parked on the lot. Not to be outdone by their larger competitor, the Apollo group of companies also has multiple brands available to rent in Darwin – Apollo Camper and Cheapa Campa. Again, following the leader, they depot the vehicles at the same place as each other and the depot is even in the same suburb as Britz. But Apollo has the bragging rights on location, a mere 8km from the airport – not 10km! 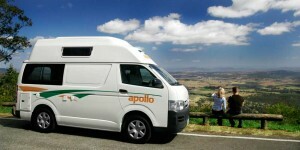 Like the other major companies, Apollo has different market segments for their campervans so look to Apollo for newer and swankier ones and look to Cheapa Camper campervans that are older and passed down from Apollo. That’s not to say they are junk, just like Mighty Campers are not junk either, it’s just that the campers are older and hence certain elements of the vehicle might be a little tattier. Wicked Campers are king of the budget market. Ironically when you are king of a market you can charge more – so you end up in another price bracket – with budget vehicles. In recent years Wicked has expanded its fleet to include some more luxury. Their original style campervans are still around but they also now up the ante all the way to brand new vehicles and 4wd campervans. This being primarily a 4wd campervan hire site, you’re not going to find me recommending a Wicked 4wd. Sorry, but if you are going to 4wd in the Northern Territory, do it in a vehicle that will get you OUT of where you are, not just IN. 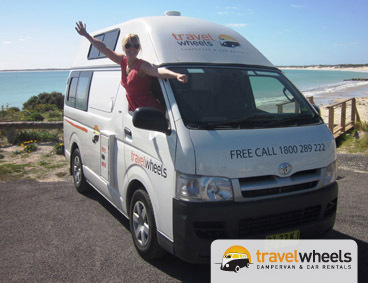 However, from a 2wd campervan point of view, Wicked Campers has quite a range to offer. One of the most talked about campervan hire companies, Wicked Campers has a reputation for being on the edge. Their marketing is aimed at the “more craziness, all the time” kind of youth market and the campers stand out significantly on the road. Other Wicked renters will spot you and come a chatting just to compare notes on the vehicle and the company has been known to get in to trouble with authorities by encouraging renters to skirt the edge of legal practices. They just see the press hoo-haa that follows as good marketing though. One other reputation they have is for not servicing their vehicles very well. 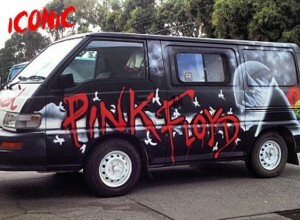 Maybe another reason they are painted so brightly, so the roadside assist guys can spot the campervan easy on approach? Good for those on a very tight budget and don’t need bells and whistles. Travel Wheels and Travellers Autobarn are both award winners and are aimed more at the youth/average budget market. Like most campervan hire companies they have different levels of vehicles based on the age of the vehicles, hi-top vs low-top and the stuff that comes with it (linen, sleeping bags, chairs etc). Both have 2-3 people campervans with both low and high top roofs and Travel Wheels is featuring a new layout in their most modern campers. 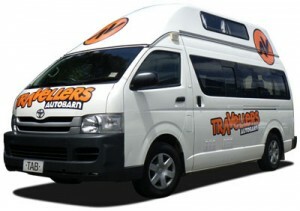 Prices, quality of campervan and inclusions are very similar, so picking between these 2 companies is going to come down to just the little things you might want included or if one of them has a special on that is going to give you the camper van for less. Well worth checking prices with these companies before booking anything with the majors. Travellers-Autobarn is about 12.5 km from airport, in the heart of Darwin, Travel Wheels is also 12.5km from the airport, just in a different part of Darwin proper. There are a couple of companies that don’t own and maintain their own vehicles. Instead they are given a wholesale rate on renting out another company’s campervans. One example is Cheapa Campa that you will often be rented out by Real Value Campervans. It is common in these cases that Real Value might be given something like 30% off what Cheapa Campa would rent the campervan out for (wholesale price), but then Real Value Campervans might only mark the camper back up by 20%, meaning you get the Cheapa Campa campervan at 10% less than if you rented it from Cheapa Campa itself. Get it? 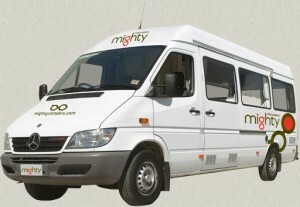 Anyway, there are a couple of companies like this is Darwin: Real Value Campervans, Australia Motor Camper Rentals, Energi Campervans and Comet Campers to name few. Now we get it to some of the smaller companies. 2 worth mentioning if you are going from Darwin via Broome to Perth or vice versa are Campabout Oz and GoCamper. Both specialize in this trip as they only have depots in those towns and you can probably save money on a Broome drop off or a one way trip between those cities. Boomerang is good if you are looking for 4wd campervans too as they run old Britz Troop carries. But all of these companies are pretty small and independent so what comes from that is the lack of national support that might be lacking with the majors. On the up side you are likely to get better personal service. Viva are “up n comers” and seem to be expanding. Worth getting a price from as they run some modern vehicles. OK, that’s it. That’s all the 2wd campervan hire companies in Darwin. Before renting anything always read CLOSELY the terms and conditions, particularly things to do with bond or security deposit and have a look at the reviews that have been linked to as they will also have comments from other users of these companies. Good luck if you are getting 2wd campervan hire and remember if you are planning on leaving the black stuff in the Northern Territory you MUST get a 4wd camper!